This declaration by Bryan Chng from the boys’ basketball team, who was at the Jurong East Sports Complex to support the girls’ team, really demonstrated the spirit of that day. 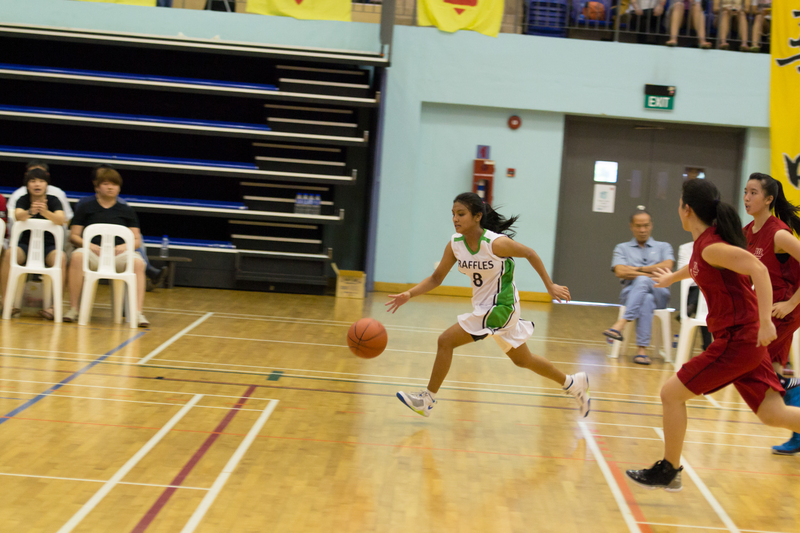 On the 23rd of May, our girls’ ‘A’ Division basketball team played a tough match against long-time arch-rivals Hwa Chong JC in a remarkable display of grit and sportsmanship. Though they eventually conceded defeat by a score of 45-25, their indomitable spirit surely left an impression on all spectators. The match got off to an intense start, with HCI’s well-drilled defense blunting our team’s attacks. The Raffles side fought to negotiate around the HCI defense, but HCI drew first blood. RI’s Cheryl Pay (#4), under pressure by two HCI players, executed a skilfull pass to Gladys Molino (#8), combining for a quick response from our team. Our girls kept the pressure up, and Wu You (#15) got the Rafflesian crowd going as she levelled the score at 6-6 with one minute left on the clock. It was soon HCI’s turn to cheer, however, when one of their players scored a 3-pointer and thus closed the first quarter with a 9-6 lead over RI. The second quarter saw multiple efforts from Wu You (#15) to score, with Gladys (#8) finally scoring with a jumper in the third minute. Although the quarter eventually ended 19-11 in favour of Hwa Chong, it was not without a good defense showing from our team. The team’s swift attacks and intercepts were instrumental in taking the shots, however, Hwa Chong proved to be the quicker and more tenacious team, capitalizing on every opportunity to take possession of the ball. After a three minute break, the girls were back on court for the second half of the match. Throughout the third quarter, the team seemed less sure of themselves, as HCI asserted their dominance on the court, taking advantage of our players’ hesitancy to force numerous turnovers. There were several missed opportunities to score, much to the supporters’ disappointment, but our girls did not let that bring down their morale. Instead, they continued to give their all, ending the quarter while still trailing 35-15. In the last quarter, the girls did not lose heart despite lagging behind by a deficit of 20 points. 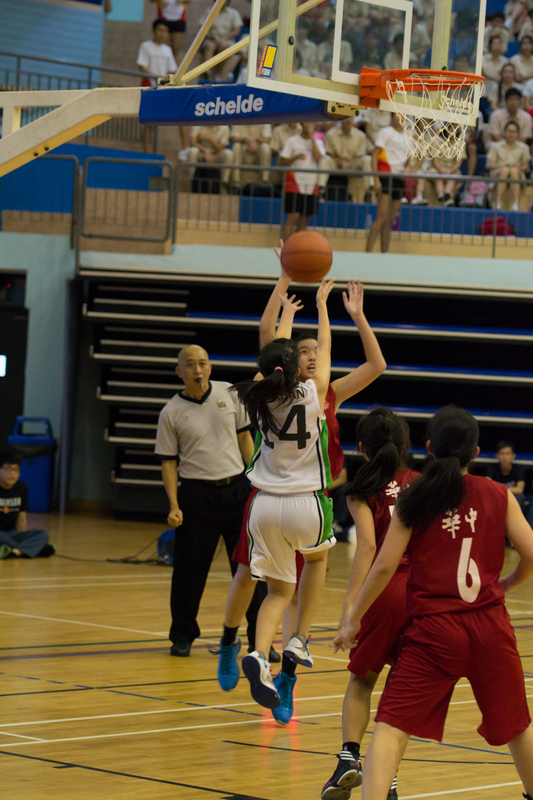 They fought back even harder, with Soh Jia Xuan (#14) netting a basket. Gladys (#8) kept the pressure up, making up for the point deficit with a slick jumper. Jia Xuan (#14) eventually made a successful three-pointer, to the elation of the Rafflesian supporters. The Rafflesian crowd paled in comparison to the flocks of HCI supporters who flooded the Jurong East stadium. But we made it count. Other members of the basketball team, such as Farah Tan and Bryan Chng did their very best to rouse the crowd, leading them in cheers and shouting encouragement to the players. Similarly, though the girls’ team may not have had scored the same number of baskets as our opponents, they definitely played their hearts out on the court, challenging the opposing team for every loose ball and basket. 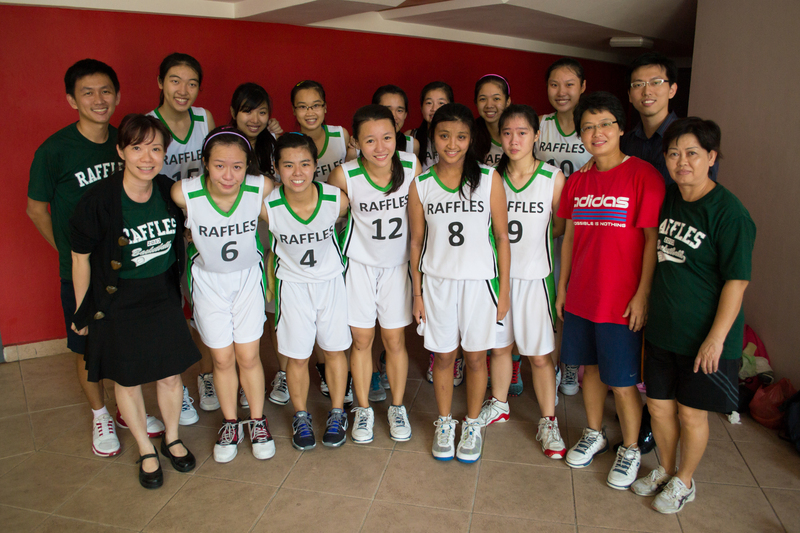 Raffles Press salutes the girls for their valiant efforts, and wishes Basketball all the best for next year’s sports season.